^ 1.0 1.1 All dates in the article are in the Gregorian calendar (unless otherwise stated). The Julian calendar as used in England in 1704 differed by eleven days. 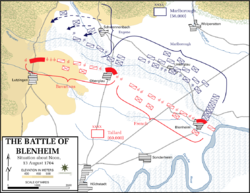 Thus, the battle of Blenheim was fought on 13 August (Gregorian calendar) or 2 August (Julian calendar). In this article, 'OS' is used to annotate（英语：annotate） Julian dates with the year adjusted to 1 January. See the article Old Style and New Style dates（英语：Old Style and New Style dates） for a more detailed explanation of the dating issues and conventions. ^ In 1704, Blindheim was in the principality of Palatinate-Neuburg (Pfalz-Neuburg), which was absorbed into Bavaria in 1808. ^ The village of Blindheim (Blenheim in English) lies on the Danube River, 10英里（16公里） southwest of Donauwörth in Bavaria, southern Germany. ^ Statistics taken from Chandler and Falkner. Some sources put the Allied strength at 56,000 and the Franco-Bavarian forces at 60,000. The number of squadrons and battalions within each army differs depending on the source.